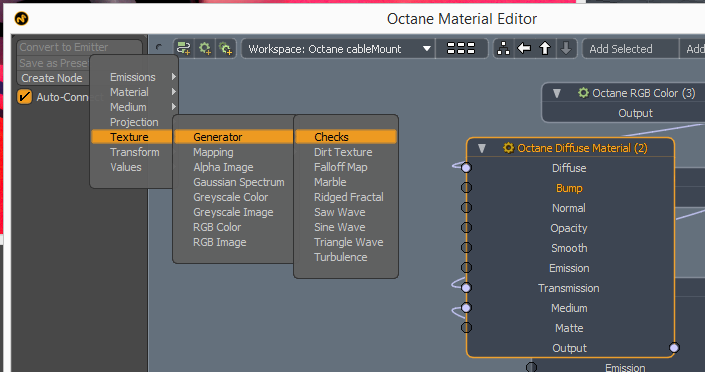 It has been a busy couple of weeks, with the Octane node based materials system being implemented into the Modo plugin. This means that all the material/texture/emission/medium nodes available in Octane Standalone can be used within the Modo plugin. 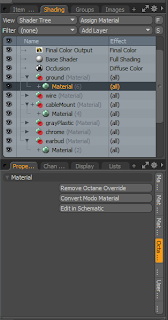 And importantly - this means that the Octane LiveDb material database can be supported. For the LiveDb, the user will download all LiveDb materials via the plugin into a Preset format. These Presets can then be drag and dropped into you Modo scenes to apply the LiveDb material to that Modo material. I will post screenshots of this shortly. In the meantime, here are some screenshots of the node based Material editing system. 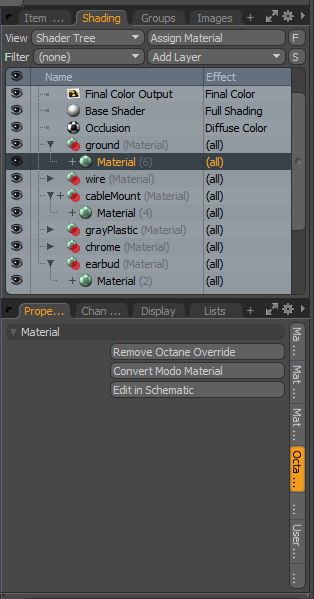 Every Modo material now has an "Octane Material" tab, and this tab contains buttons to override the Modo material with an Octane material, and to open the Schematic panel with the nodes for that material. Once a Modo material has be overridden, the schematic is opened where the node contents can be edited, and new nodes added. 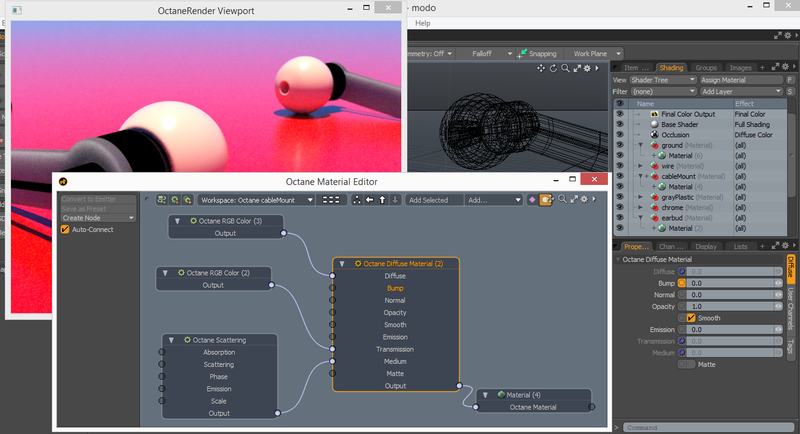 Each overridden Modo material has it's own Schematic view, so you can Material Pick from the Octane Viewport to rapidly access the Octane nodes for that material. If you select a channel (ie. the bump pin on the material node), then click the 'Create Node' button, only the nodes which can be plugged into that pin are available. And once the node is created, it is automatically connected to the selected pin. So the workflow is very fast, and intuitive. 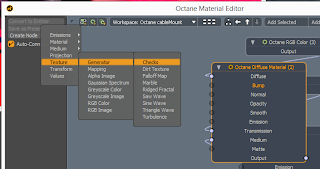 As you edit/update Octane materials in the Schematic, the OctaneRender Viewport is immediately updated to reflect the change in the material. Rendering of animations is now also implemented, as is support for rigged characters. So the plugin a rapidly approaching the close beta-test phase.